Malcolm Muggeridge, the late British journalist, author and editor of Britain's late, great weekly satirical magazine, Punch, once said that he never tired of reading Mark Twain, or reading about him. Although I don’t always agree with Mark Twain’s worldview, I share that notion. Mark Twain is one of my favorite writers. 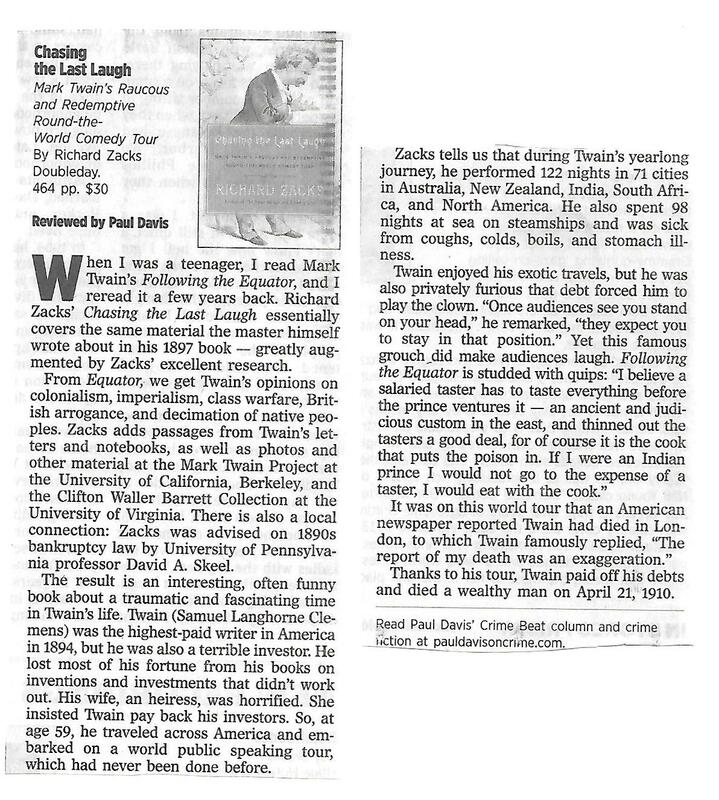 So I was pleased to be able to review a book about Mark Twain, Richard Zacks' Chasing the Last Laugh: Mark Twain's Raucous and Redemptive Round-the-World Comedy Tour, for the Philadelphia Inquirer. When I was a teenager, I read Mark Twain's Following the Equator, and I reread it a few years back. 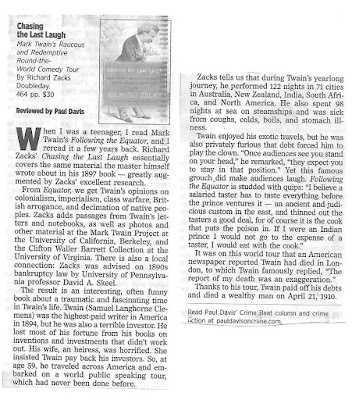 Richard Zacks' Chasing the Last Laugh essentially covers the same material the master himself wrote about in his 1897 book - greatly augmented by Zacks' excellent research. From Equator, we get Twain's opinions on colonialism, imperialism, class warfare, British arrogance, and decimation of native peoples. Zacks adds passages from Twain's letters and notebooks, as well as photos and other material at the Mark Twain Project at the University of California, Berkeley, and the Clifton Waller Barrett Collection at the University of Virginia. There is also a local connection: Zacks was advised on 1890s bankruptcy law by University of Pennsylvania professor David A. Skeel. The result is an interesting, often funny book about a traumatic and fascinating time in Twain's life. Twain (Samuel Langhorne Clemens) was the highest-paid writer in America in 1894, but he was also a terrible investor. He lost most of his fortune from his books on inventions and investments that didn't work out. His wife, an heiress, was horrified. She insisted Twain pay back his investors. So, at age 59, he traveled across America and embarked on a world public speaking tour, which had never been done before. Coincidence! I've been reading Twain while on-the-road for family visit. Perhaps you and I will need to compare notes and discuss Twain's stories, novels, and nonfiction in the future. For now, though, I congratulate you on a fine review; I will be adding this book to my "must read" list for the not too distant future. If you were to choose a Twain favorite, which would you choose? I would not choose _Huck Finn_, but that is a discussion for another time. All the best from the Gulf coast. Ole Huck is my favorite Twain novel, and I believe it is an uneven novel, but still a great one. I'm also very fond of Twain's "Roughing It" and "Life On the Mississippi." PS: How is your health? Improving? As Dr. Frankenstein exclaimed, "Its alive!" So am I. Who can ask for anything more?